The Saljuq period of the eleventh and twelfth centuries saw the arrival in Iran of Türkmen nomads from Central Asia and the beginning of Turkish rule. 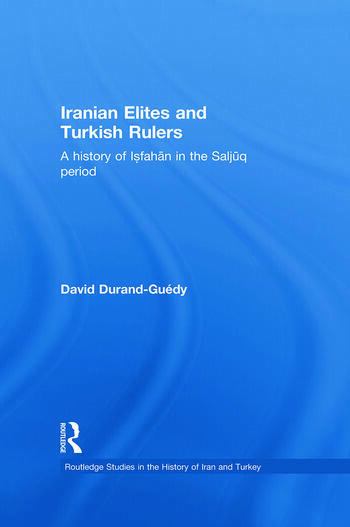 Through the example of the city of Isfahan, the book analyses the internal evolution of Iranian society in this period and the interaction of the Iranian elites and Turkish rulers. Drawing on an analysis of a wide range of sources, including poetic and epistolary material, this study fills an historiographical gap and casts new light on the two centuries prior to the Mongol invasion. This comprehensive analytical study provides a new contribution to the understanding of many crucial issues: the cultural divide between Western and Eastern Iran; the military potential of city-dwellers; the attitude of the Turkish rulers toward cities and city life; the action of the famous vizier Nizam al-Mulk; the meaning of the Ismaili uprising; and above all the structure of the local elite, organized into rival networks and largely autonomous vis-à-vis state powers. The study is enhanced by a variety of additional features, including extensive genealogical tables, Arabic script and maps. Providing a new understanding of the cultural identity of Iran, this book is an important contribution to the study of the history of Iran and the Medieval period. David Durand-Guédy is currently a visiting fellow at the University of Tokyo. Trained in France (ENS LSH, Sorbonne, Langues’O), he has made numerous stays in the Middle-East, especially Iran. He has published several articles in French and English on the history of pre-Mongol Iran.